The majority of natural gas (NG) is transported in gaseous form via onshore or offshore gas pipelines. For stranded gas reserves or long transport distances, it becomes more economical to liquefy the natural gas prior to transportation or storage. 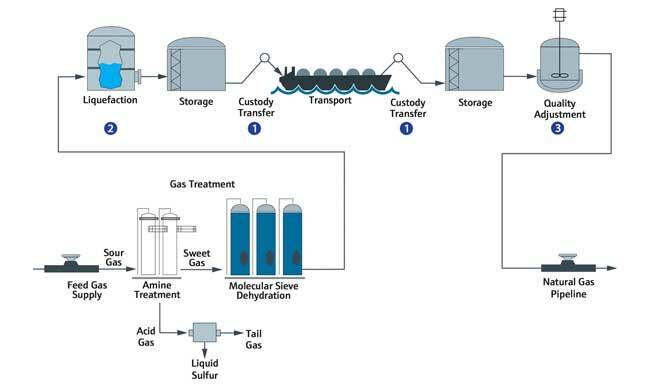 The liquefaction of natural gas to LNG often involves the use of a mixed refrigerant (MR) process, and monitoring the composition of the MR is an essential for efficient plant operation. Once liquefied, LNG transfer to ships or trucks involves custody transfer, and monitoring the BTU of the LNG is critical to ensuring that contractual obligations are met. Once LNG arrives at its destination, it is regasified and often requires quality adjustment to ensure the resulting NG meets local pipeline specifications. The Optograf™ analyzer can measure LNG and MR as a cryogenic liquids, improving the quality and speed of results while reducing operating costs.